Viridesco – K1 Strain - Live Resin This elegant frozen resin is smooth. Magnificent for vaping and smoking! Offered in One Gram jars sealed in mylar. Because the THC in this extract is not fully decarboxylated, it could be eaten for the benefits of THC-A without a pronounced psychoactive effect. This high-end Live Resin has been independently tested at MB labs to contain over 92.89% Cannabinoids! This includes 84.87% THC! Harvested live (uncured) K1 Cannabis flowers have been carefully selected to create this sublime live resin. Processed from fresh frozen flowers for optimal processing extraction, this product’s quality exceeds the expectations of any concentrate connoisseur. K1 is a super rare sativa dominant hybrid strain created by crossing the potent Durban Poison and LA Kush strains. The high starts with a euphoric rush of energetic buzzy waves that leave you feeling tingly and happy with a light and airy effect in the back of the head. As this buzzing builds, you’ll start to feel an increase in sociability, leaving you feeling talkative and slightly giggly. 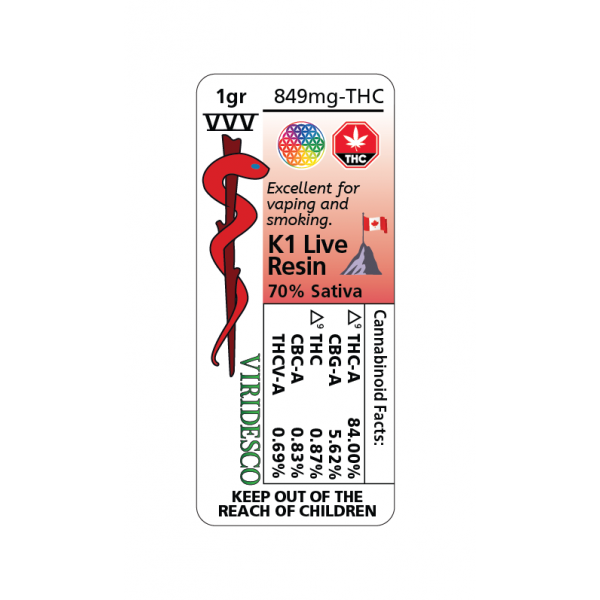 Viridesco – K1 Strain - Live Resin This elegant frozen resin is smooth. Magnificent for vaping and smoking! Offered in One Gram jars sealed in mylar. Because the THC in this extract is not fully decarboxylated, it could be eaten for the benefits of THC-A without a pronounced psychoactive effect. This high-end Live Resin has been independently tested at MB labs to contain over 92.89% Cannabinoids! This includes 84.87% THC! Rank Cannabinol %Value 1) Δ⁹ THC-Acid 84.00 2) CBG-A 5.62 3) Δ⁹ THC 0.87 4) CBC-A 0.83 5) THCV-A 0.69 Harvested live (uncured) K1 Cannabis flowers have been carefully selected to create this sublime live resin. Processed from fresh frozen flowers for optimal processing extraction, this product’s quality exceeds the expectations of any concentrate connoisseur. K1 is a super rare sativa dominant hybrid strain created by crossing the potent Durban Poison and LA Kush strains. The high starts with a euphoric rush of energetic buzzy waves that leave you feeling tingly and happy with a light and airy effect in the back of the head. As this buzzing builds, you’ll start to feel an increase in sociability, leaving you feeling talkative and slightly giggly.